Indianapolis has been startled by the newly created drug with a surprising ingredient, bug spray. The Indianapolis police force and emergency medical professionals have seen an increase in drug overdoses due to drugs mixed with Raid bug spray, known on the street as “Katy” or KD for short. Users who have smoked the combination have been known to exhibit strange behaviors and even fall into a zombie like stupor. ‘KD’ is usually a mix of tobacco, marijuana or spice then doused in a brand of heavy duty bug spray like Raid. The fire department tells new sources it’s like nothing they’ve ever seen. “You look at what it does to a bug, and then you got to think what it’s doing to your brain and your body and everything else,” Indianapolis firefighter Scott Lebherz told IndyStar. “We describe it as being like a zombie. They cannot talk to us,” Indianapolis Fire Department Captain Chris Major told WXIN. 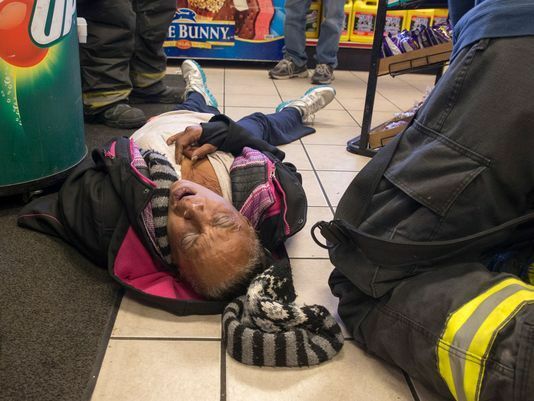 A man is helped off the ground, suspected of being on KD, a local drug involving bug spray being applied to a cigarette of some kind, in Indianapolis, November 2017. “Their movements are slow and lethargic, a lot of drooling and a loss of function. We find them with their clothes off, eating the grass, pulling dirt out of the ground and trying to put it in their mouth,” said Cpt. Major. It’s effects take hold almost immediately, “We find people passed out with it still in their hand. That is how fast it has an effect on them,” said Cpt. Major. 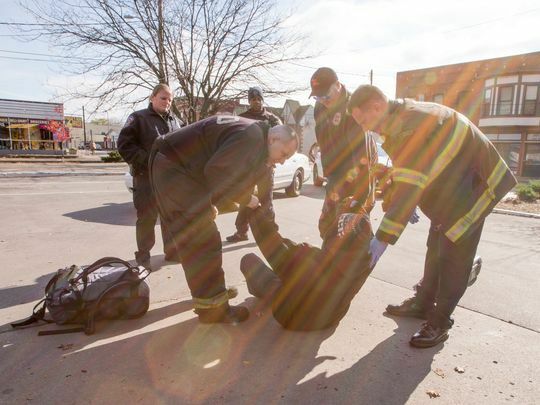 In one day, there was almost a dozen overdose calls in one day for IFD Station 27. “They do not know what is in this stuff or who has made it so they are all taking chance. Which for some reason they are willing to do because we get the same people using over and over again,” said Cpt. Major. Crews report that most KD overdose calls come from the area near East 10th and North Rural st in Indianapolis. There have been multiple drug busts recently in the area, with police looking to find the source and the dealers who sell the drug. But in the case with these overdoses, not much can be done with the fire crews. All they can do is check the patients’ blood pressure and wait for an ambulance to arrive. In the last year, IFD Station 27 has had 5,100 runs and a great deal of those calls were due to overdoses. “We send them off to the hospital to get checked out and within two hours they may be back out there on the street doing it again. We have had the same person multiple times in one day,” said Cpt. Major. The company that produces the bug spray Raid and other similar pest control products, SC Johnson, says the claims of the accounts about their bug spray are “completely inaccurate.” Arguing that smoking marijuana or anything other substance cut with their pest killers will not produce zombie effects as reported by the media. “We’ve seen an increasing number of media reports about drug users intentionally misusing pest products such as Raid and OFF!, made by SC Johnson, to achieve a catatonic state for up to 45-minutes. Such reports are completely inaccurate,” Kelly M. Semrau, the company’s Senior Vice President Global Corporate Affairs, Communication and Sustainability, told Forbes in an emailed statement. The active ingredient in bug sprays is usually pyrethoids, which kill insects by interfering with the nervous system signaling, said Dr. Daniel Rusyniak, medical director of the Indiana Poison Center. The poison works like this, as the brain communicates with the rest of the body through the nervous system and the nerves send the body messages through electronic signals. The nerve then stops firing and then recovers itself for when its time to fire again. Excessive firing can be lethal and in most cases are with bugs. An insect exposed to pyrethoids becomes paralyzed and then die. “But at high doses, they will affect the human nervous system,” Rusyniak said, in contradiction of what SC Johnson said about their product. Symptoms in humans are similar to insects, the excessive nerve firing can lead to tingling and numbness, and at higher doses, users can experience tremors, twitching and convulsions. In an extreme case, one may develop seizures or fall into a coma. Those who smoke synthetic marijuana laced with bug spray can have results of respiratory depression, from the chemicals irritating the throat. In those cases, patients are treated with fluids and ventilator. In the extreme reactions that have patients agitated, excited or twitching, doctors then give them drugs to slow the nerve firings, Rusyniak said.